Some new information from the American Academy of Pediatrics has been published on the use of sports and energy drinks by children, a summary is provided below. You can download the complete report at the bottom of this page. Sports and energy drinks are heavily marketed to children and adolescents, but in most cases kids don’t need them – and some of these products contain substances that could be harmful to children. In a new clinical report, the American Academy of Pediatrics (AAP) outlines how sports and energy drinks are being misused, discusses their ingredients, and provides guidance to decrease or eliminate consumption by children and adolescents. 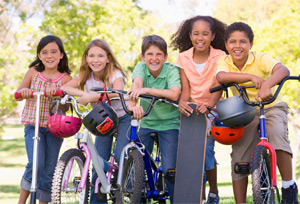 The report, “Sports Drinks and Energy Drinks for Children and Adolescents: Are They Appropriate?” is published in the June 2011 issue of Pediatrics (published online May 30). Sports and energy drinks are different products, said Holly J. Benjamin, MD, FAAP, a member of the executive committee of the AAP Council on Sports Medicine and Fitness, and a co-author of the report. Sports drinks, which contain carbohydrates, minerals, electrolytes and flavoring, are intended to replace water and electrolytes lost through sweating during exercise. Sports drinks can be helpful for young athletes engaged in prolonged, vigorous physical activities, but in most cases they are unnecessary on the sports field or the school lunchroom. Energy drinks contain substances not found in sports drinks that act as stimulants, such as caffeine, guarana and taurine. Caffeine – by far the most popular stimulant – has been linked to a number of harmful health effects in children, including effects on the developing neurologic and cardiovascular systems. Energy drinks are never appropriate for children or adolescents, said Dr. Schneider and Dr. Benjamin. In general, caffeine-containing beverages, including soda, should be avoided. The report contains tables listing specific sports and energy drinks available today and their contents. Pediatricians should highlight the difference between sports and energy drinks with patients and their parents, and talk about the potential health risks. Routine ingestion of carbohydrate-containing sports drinks by children and adolescents should be avoided or restricted, because they can increase the risk of overweight and obesity, as well as dental erosion. You can download the complete clinical report here.